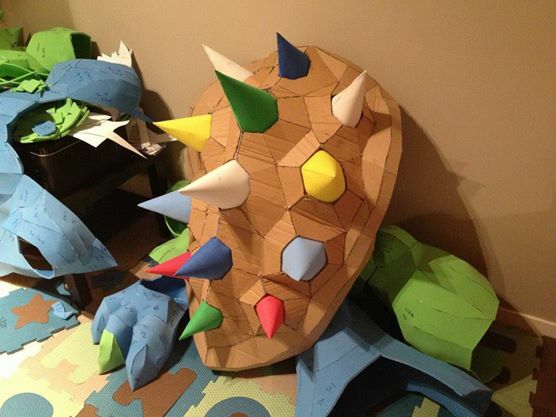 Impressive Foam Bowser Costume « Adafruit Industries – Makers, hackers, artists, designers and engineers! The last 2 weeks was a real race to the finish. I was up until 2am almost every night trying to get all the pieces finished. I coated all the pieces with a layer of white glue to seal the foam. Then I used an elastomeric paint to build up a skin. 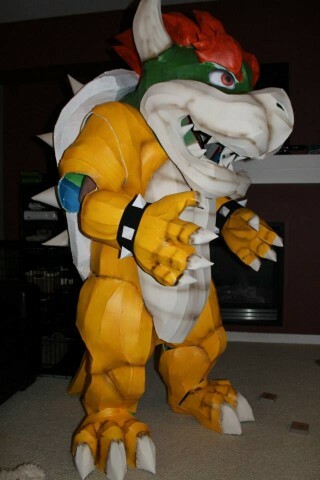 I wanted to use latex but it was too cost prohibitive to coat the entire costume. The elastomeric paint provided a good alternative. It goes on really thick and has a lot of flexibility. I used regular interior house paint for the colors and airbrushed in the final details. For the shell I used wood filler along all the seams to try to mask the corrugated edges of the cardboard. I had a few roadblocks right near the end. Two days before I had to have it finished I was trying to figure out why I couldn’t get the head to connect properly with the body. I realized I had completely missed building the neck for the costume. I had to quickly put together a neck. I wound up building it out of cardboard. It was probably a smart choice because it actually took the brunt of a lot of the costumes weight. I didn’t have time to coat it with anything, just a quick coat of green paint. 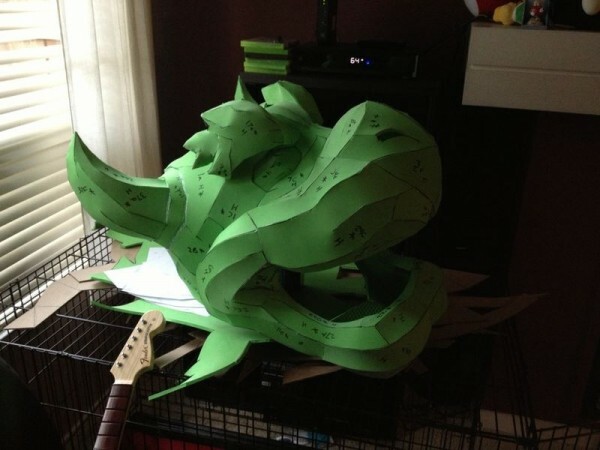 Once I had everything together the costume wasn’t much more than a giant statue so I had to figure out two things, 1) how do I cut this thing up so that I can get inside and 2) how do I separate this thing so I have some mobility. I wound up separating the costume into 4 pieces, the body, two arms, and the legs. This worked really good for getting in and out of the costume, I could have it on and off in minutes. The big problem though was mobility. I made cuts at the knees and some strategic cuts at the feet to try and get some mobility but I couldn’t do much more than shuffle along at a snails pace. The arms worked out well, I cut the forearms off and used hot glue and duct tape at the elbows to get a fair bit of mobility. The downside though was that I have big flapping seams at the elbows. Hopefully down the line though I can fix this up with some fabric to make the seams less noticable. Read more at The Replica Props Forum and see more photos at Facebook. Thanks for sharing my costume! 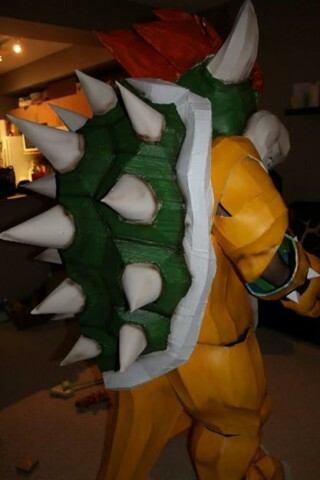 It was a lot of fun to build and wear. Though a ton of work. I made the files available for anyone who’d like to build it. I’d love to see some other builds!